Apple Pay is available in quite a few countries and territories already, but its international expansion isn’t slowing down. One of the countries most rumored to get the mobile payments service has been Germany, with some mumblings from May suggesting a launch in the fall or winter. The former of those time frames seems more likely in light of new information that’s surfaced today. If you’re in Germany running the latest betas of iOS 11 and watchOS 4, when you set up your Apple Watch you will be presented with the screens you can see below. They tell you about Apple Pay and apparently give you the option of adding a German bank card to the service. 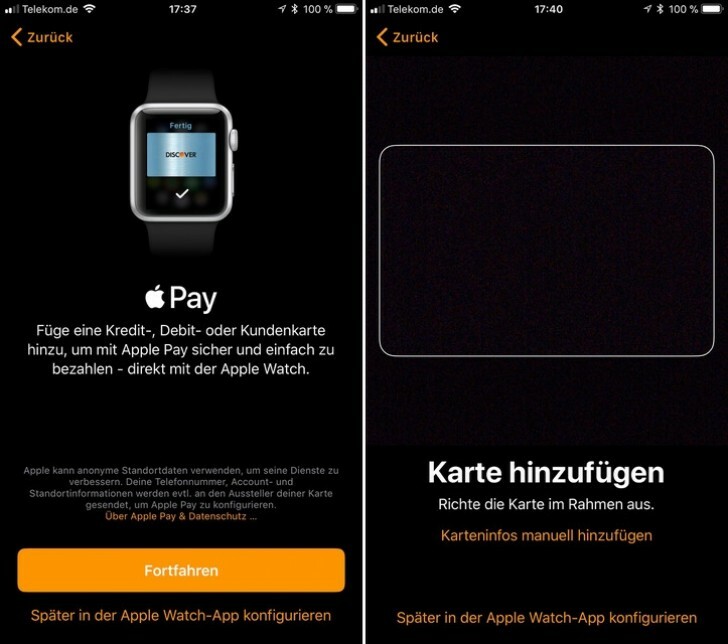 The adding process itself fails, but the fact that this feature is now partially enabled ahead of the grand release of iOS 11 and watchOS 4 next month means we may see Apple Pay launching in Germany in September as well – perhaps very soon after the new operating system versions go live for everyone. The finalized builds of iOS 11 and watchOS 4 are expected to be outed following Apple’s traditional September event, where it’s going to unveil three new iPhones as well as a new Apple Watch with LTE data connectivity.